Rio de Janeiro, Brazil – The eventing horse inspection officially kicked off equestrian competition at the 2016 Olympic Games in Rio de Janeiro, Brazil, Friday. Over the next 14 days, 204 athlete-and-horse combinations in the three equestrian disciplines of eventing, dressage, and show jumping will compete for coveted Team and Individual medals at Rio’s Deodoro Olympic Equestrian Center. The U.S. Olympic Eventing Team of Phillip Dutton and Mighty Nice, Lauren Kieffer and Veronica, Boyd Martin and Blackfoot Mystery, and Clark Montgomery and Loughan Glen were deemed fit and ready to compete and will join a total of 65 combinations representing 24 countries. The U.S. Team will be led by U.S. Eventing Coach David O’Connor, the 2000 Olympic Games Individual Gold medalist. The U.S. has drawn 12th in the starting order among the 13 countries participating in team competition. The U.S. riders will compete in the following order. Leading off for the U.S. will be Martin (Cochranville, Pa.), a 2012 Olympic veteran, and highest-placed U.S. rider at the Alltech FEI World Equestrian Games in 2014 and 2010, and Team Gold medalist at the 2015 Pan American Games. Martin will ride the Blackfoot Mystery Syndicate LLC’s Blackfoot Mystery, a 2004 Thoroughbred gelding. This partnership is only a year old but has already proven its merit with a top-ten finish at the 2015 The Dutta Corp./USEF Three-Star Eventing National Championship. In 2016, Martin and ‘Big Red’ placed sixth at the Rolex Kentucky Three-Day Event presented by Land Rover. Next in the order is Montgomery (Bryan, Texas), a first-time Olympian, who will ride Holly and William Becker, Kathryn Kraft, and Jessica Montgomery’s Loughan Glen, a 2003 Irish Sport Horse gelding. This pair has been based in England for the last three years, gaining significant competitive experience. Montgomery and ‘Glen’ had an impressive 2015, winning the CIC3* at the Belton International, CIC2* at Somerford Park International, and CCI3* at Blenheim Palace International, along with a sixth-place finish at Luhmühlen CCI4*. Most recently, this pair won the 2016 Land Rover Great Meadow International presented by Adequan. First into the arena for the U.S. on day two will be Kieffer (Middleburg, Va.), a first-time Olympian, who will ride Team Rebecca LLC’s Veronica, a 2002 KWPN mare. ‘Troll’, as she known in the barn, is a tough, sassy mare that has won the heart of Kieffer in their three-year partnership. This duo helped bring home a Team Bronze medal at the 2015 CICO3* at Aachen. Most recently, they were winners of the 2016 Rolex/USEF CCI4* National Championship at the Rolex Kentucky Three-Day Event presented by Land Rover. Anchoring the U.S. Team will be Dutton (West Grove, Pa.), who is contesting his sixth Olympic Games, having earned Team Gold medals in 2000 and 1996 for his native Australia. He is also a two-time Pan American Games Team Gold medalist for the U.S. and will ride HND Group’s Mighty Nice, a 2004 Irish Sport Horse gelding. Mighty Nice, known as Happy, was imported by Dutton and Bruce Duchossois in 2010. Following Duchossois’ passing in 2014, friends put together the HND Group in order to support Dutton’s goals of competing Happy at the highest levels of the sport. The pair has been consistently demonstrating its athletic prowess, earning the Reserve Championship title at the 2015 The Dutta Corp./USEF Three-Star Eventing Championship and placing fourth at the 2016 Rolex Kentucky Three-Day Event presented by Land Rover. The eventing competition commences with the dressage phase, August 6-7. The cross-country phase follows on August 8, and the competition concludes on August 9 with show jumping. (MAHWAH, N.J.) – July 11, 2016 – After two days of world-class eventing competition, USA’s Clark Montgomery claimed the 2016 Land Rover Great Meadow International title in Virginia, having ridden a near flawless riding performance aboard Loughan Glen. To the delight of the home spectators, the event also served as the final preparatory event for riders from the 2016 U.S. Olympic Eventing Team prior to the Rio 2016 Olympic Games. For more information about the 2016 Land Rover Great Meadow International, please visit: http://www.greatmeadowinternational.com. Lausanne (SUI), 11 July, 2016 – Clark Montgomery (USA) flew back from Britain to his home country to lead a strong American quartet to victory in the fifth leg of the 2016 FEI Nations Cup™ Eventing, held for the first time outside Europe, at the Land Rover Great Meadows International at The Plains, Virginia. (THE PLAINS, VIRGINIA) – July 10, 2016 – Clark Montgomery rode a near flawless riding performance over both days of the Land Rover Great Meadow International to take the 2016 title riding Loughan Glen. Montgomery led the competition from start to finish after delivering a commanding dressage score of 36.3 and a double-jumping clear over show jumping and cross-country with just 1.2 time penalties finishing on a final score of 37.5. In the stunning Virginia Plains setting, under a sun-drenched two days of competition, the 40 competitors featuring many of the world’s top eventing riders thrilled the thousands of fans who came to cheer on their equestrian heroes in just the third running of the Great Meadow International. Marilyn Little (USA) took second place riding RF Demeter on a score of 43.8, with Great Britain’s Jodie Amos finishing third riding Wise Crack on 49.0. Of the 40 starters on the final cross-country day, 36 completed the course with just four riders finishing with no time penalties. To the delight of the home spectators, the event also served as the final preparatory event for riders from the 2016 U.S. Olympic Eventing Team prior to the Rio 2016 Olympic Games. The 2016 Land Rover Great Meadow International featured riders from the 2016 U.S. Olympic Eventing Team including Phillip Dutton, Lauren Kieffer, Boyd Martin, Clark Montgomery, and traveling reserve, Maya Black. As well as riding for individual honors, selected riders were also representing their country in the inaugural Eventing Nations Cup at the Land Rover Great Meadow International, as the FEI and USEF chose the event to host the first-ever FEI Nations Cup™ Eventing Competition outside of Europe. Clark Montgomery’s dominant win on Loughan Glen, along with three fast and clear cross-country rounds from the other team members gave the U.S. a clear victory in the Nations Cup taking the win on a score of 138.3. Canada finished second on 177.6, with Great Britain in third place on 254.3. The Plains, Va. – The Land Rover U.S. Eventing Team made history Sunday, handily capturing the inaugural FEI Nations Cup™ Eventing competition at the Land Rover Great Meadow International presented by Adequan®. Leading from start to finish, the team of Phillip Dutton, Lauren Kieffer, Boyd Martin, and Clark Montgomery had a favorable competition with noteworthy performances in their final stateside preparation event before the Rio Olympic Games, scoring 138.3 penalties. Canada moved up to second with an overall score of 177.6 penalties and Great Britain placed third with 254.3 penalties. Montgomery (Tetbury, England) and Loughan Glen, owned by Jess Montgomery, Kathryn Kraft, and Holly and Bill Becker, were the overnight leaders and did not disappoint the massive crowd at Great Meadow as they led from start to finish. The pair performed the best dressage test of the competition, scoring 36.3 penalties, remained faultless through show jumping, and incurred 1.2 time penalties by going three seconds over the optimum time of 6:36 in the cross-country phase for a combined score of 37.5 penalties. Dutton (West Grove, Pa.) was the pathfinder for the team and the competition going first in all three phases. Riding Ann Jones and Thomas Tierney’s Fernhill Fugitive, Dutton had a credible first day scoring 47.2 penalties in dressage and going clear in show jumping. The pair knocked down a flag at the imposing Beverly Equestrian Brush Corners obstacle, but negotiated the remainder of the course without incident, adding only 3.2 time penalties to their two-phase score of 50.4 penalties. Martin (Cochranville, Pa.) and Gloria Callen’s Welcome Shadow were clear in show jumping to enter the final phase on their dressage score of 48.8 penalties. The pair rode second for the team on the Mike Etherington-Smith-designed cross-country course adding 1.6 time penalties to also finish on 50.4 penalties. Kieffer (Middleburg, Va.) and Marie Le Menestrel’s Meadowbrook’s Scarlett contributed to the winning team score having just one rail down in show jumping and incurring a mere .4 time faults in cross-country for a final score of 55 penalties. Individually, Americans placed four out of the top five. Marilyn Little and RF Demeter, owned by Jacqueline Mars, Raylyn Farms and Patrick and Eileen Witte, moved up from fourth after day one to place second. Holly Payne Caravella and Santino, owned by Beth Groblewski, were fourth with 50 penalties and Hannah Sue Burnett rode Under Suspection, owned by Mary Ann Ghadban, from 16th place to fifth overall scoring 50.2 penalties. Jodie Amos and Wise Crack of Great Britain were third on 49 penalties. On-demand footage of the competition will be available shortly on USEFNetwork.com. Woodstock, England – The Blenheim Palace International Horse Trials CCI3* came to an exciting conclusion on Sunday as 78 combinations moved forward to the show jumping phase over the Alison Abrahams-designed course. Clark Montgomery and Loughan Glen jumped a beautiful double-clear round to claim top honors at the prestigious competition after leading from start to finish. The U.S. contingent made its presence known throughout the competition with solid performances and a total of four combinations finishing in the top 12. Montgomery (Tetbury, England) and Jessica Montgomery, Kathryn Kraft, and Holly and William Becker’s Loughan Glen began their Blenheim campaign with a stellar dressage test on Friday to receive an impressive score of 33.8 and sit on top of the leaderboard following the first phase. He and the 2003 Irish Sport Horse gelding laid down a textbook double-clear cross-country round over Eric Winter’s track to maintain their lead heading into the final phase with over an eight-point lead. Not letting the pressure of the situation get to him, Montgomery gave Loughan Glen an excellent ride in the show jumping phase, jumping cleanly and inside the time to earn the biggest win of his career. The talented pair earned the 2015 Blenheim CCI3* title on their dressage score of 33.8. Montgomery’s win makes him only the third American to win the Blenheim Palace International Horse Trials CCI3* in the 25-year history of the event, along with Bruce Davidson (1994) and Kim Severson (2001). Lauren Kieffer (Middleburg, Va.) and Team Rebecca, LLC’s Veronica had excellent performances throughout their first trip to Blenheim. The recipients of a Karen E. Stives Endowment Fund for High Performance Eventing Competition Grant through the USET Foundation delivered their signature smooth dressage test on Thursday to score 46.2. Kieffer and the 2003 Dutch Warmblood mare made light work of the cross-country track, adding four-tenths of a time penalty for being a second over the optimum time of 10 minutes 51 seconds. The pair jumped a double-clear show jumping round to finish on a score of 46.6 in sixth place, earning Kieffer the best first-timer award as the highest-placed first-time competitor. Emily Beshear (Somerset, Va.) gave Deep Purple Eventing’s Shame on the Moon a great ride in the horse’s European debut, beginning with a lovely dressage test that received a score of 44.5. The USEF Land Rover Competition Grant recipients confidently tackled the cross-country track, adding only 3.2 time penalties to their score. She and 2006 Trakehner/Thoroughbred mare brought their weekend to a splendid finish with a double-clear show jumping round to finish on a score of 47.7 in seventh place. Will Coleman (Gordonsville, Va.) and The Four Star Eventing Group’s OBOS O’Reilly had a strong showing at Blenheim, starting off with a respectable dressage test on Thursday, despite the horse being quite tense, scoring 51.1. He and the 2003 Irish Sport Horse gelding earned redemption on Saturday with a masterful double-clear cross-country round. The USEF Land Rover Competition Grant recipients continued to display their jumping expertise as they were double-clear in the show jumping phase, finishing in 11th place on their dressage score of 51.1. Rising stars Elisa Wallace (Jasper, Ga.) and David and Jill Hopcroft’s Simply Priceless demonstrated experience beyond their years throughout their European debut at Blenheim. 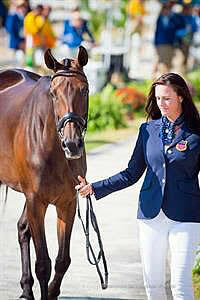 The USEF Land Rover Competition Grant recipients started their weekend with an accurate dressage test scoring 50.1. On cross-country day, they laid down a solid cross-country round, jumping cleanly and adding 7.6 time penalties to their score. Show jumping is the most challenging phase for Wallace and the 2001 Thoroughbred gelding, but they had a respectable round with a single rail down for four faults to finish on a score of 61.7 in 29th place. Elisabeth Halliday-Sharp (East Sussex, UK) and Deborah Halliday’s Fernhill by Night were the U.S. pathfinders throughout the competition, starting things off with a great dressage test that scored 45.9. She and the 2003 Irish Sport Horse gelding were having a fantastic cross-country round until running into an issue at the Cheltenham Annual Members’ Badges skinnies combination at 17B, incurring 20 jumping penalties. They finished strongly but also added 26.0 time penalties to their score. The duo ended its weekend on a high note with a wonderful double-clear show jumping round, finishing in 62nd place on a score of 91.9. Find out more about the Blenheim Palace International Horse Trials and view results. Salzhausen, Germany – The last phase at the Luhmühlen CCI4* presented by DHL saw a big show jumping course designed by Heiko Wahlers (GER) that determined the final placings on Sunday. In addition to the large track, time was tough to make with nine combinations having double clear show jumping rounds. USEF Land Rover Competition Grant recipients Clark Montgomery and Loughan Glen were among those combinations that delivered a double clear round on the final day. Despite the challenging cross-country phase on Saturday, the pair had an immaculate round to finish in sixth place with a score of 37.50. Montgomery (Tetbury, England) and Jessica Montgomery, Kathryn Kraft, and Holly and William Becker’s 12-year-old Irish Sport Horse gelding began the competition in ninth place with a score of 37.10 in the dressage phase. The pair improved to seventh place after cross country, adding just four-tenths of a penalty point to their score for being a second over the optimum time, before ultimately finishing in sixth place on Sunday. Montgomery and Loughan Glen easily held their own in a field of top international combinations throughout the competition. “It is a great start to have him back in winning form and I’m excited about what the future holds,” Montgomery added. Ingrid Klimke (GER) and FRH Escada JS won the CCI4* on their dressage score of 32.70. Clark Montgomery (USA) produces a superb performance on Loughan Glen to take the lead after Dressage at the Mitsubishi Motors Badminton Horse Trials, fourth leg of the FEI Classics™ series. Photo: Kate Houghton/FEI. Lausanne (SUI), 9 May 2014 – Stylish American rider Clark Montgomery thrilled the capacity crowd at the Mitsubishi Motors Badminton Horse Trials (GBR), fourth leg of the FEI Classics™ 2013/2014, when he deservedly took the lead. His Dressage test was a model of balance, consistency and harmony despite the wind that has battered the Gloucestershire site all day. Montgomery, 32, was third last to go on William and Holly Becker’s 11-year-old Loughan Glen and scored the excellent mark of 33.5 penalties. This gives him a 2.5-penalty advantage over Australia’s Paul Tapner and Kilronan, who had until then maintained the lead since yesterday. Francis Whittington (GBR), the highest placed of the home side, is now in third place on Easy Target, just 0.2 penalties behind Tapner. 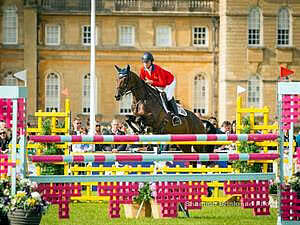 Montgomery is based in England, just down the road from Badminton with CCI4* judge Christian Landolt (SUI). “The horse has put in some good marks before and I knew he was capable of this standard if all went well,” said Montgomery of the Limerick-sired bay gelding on which he finished third at Blenheim CCI3* (GBR) last year. The three top-placed horses are all Irish-bred, which may be an advantage if the rain which is forecast to fall tonight materialises. “The ground will definitely suit my horse and I’ll be quite happy if it keeps on raining!” said Tapner. Lucinda Fredericks (AUS), who scored the only other sub-40 mark, is now fourth on Flying Finish, just ahead of Sir Mark Todd (NZL), the oldest rider in the field (at 58) and the only one to have two horses in the top 10. The four-time Badminton winner is equal fifth on NZB Campino and equal ninth on the 10-year-old Leonidas ll. Six nations are represented in the top 10. Olympic silver medallist Sara Algotsson-Ostholt (SWE), who is paying her first visit to Badminton, is in equal fifth place with Todd on 40.5 with Reality 39 (formerly called Mrs Medicott), on which she won a team silver medal at last year’s FEI European Eventing Championships. William Fox-Pitt (GBR) was a happier man after scoring 41.0 on Parklane Hawk. His first ride, Cool Mountain, disappointed and is in equal 57th place, which leaves him in equal seventh place with Andrew Nicholson (NZL) on Nereo. Danish rider Peter Flarup made a great start to his first Badminton and is in equal ninth with a score of 41.8 on the Danish warmblood mare Callista E, on which he was 12th at Boekelo CCI3* (NED) last year. Flarup, who has been riding at championship level since 1997, had his best CCI4* result at Pau in 2010 on Silver Ray. Nearly half the field of 83 scored under 40 penalties in the Dressage, thus ensuring a thrilling day tomorrow. The big news for riders is that the middle element of fence 18abc, a trio of logs on an S-bend which was proving a hot topic, has been removed. This would have involved a sharp right-hand turn at the foot of a mound, and the organisers decided that the heavy rain that is forecast might make the turn slippery. King, who first won Badminton in the very wet year of 1992, produced her best Badminton test on the ebullient 17-year-old Imperial Cavalier, on which she was third in 2011 and fourth in 2010. She earned the loudest cheers of the day and is now in 12th place on 42.8. Kristina Cook (GBR), who has been competing at Badminton for more than 20 years and is in 23rd place with a mark of 45.8 on her home-bred De Novo News, pronounced the Cross Country course to be “super”. Watch live coverage of the Cross Country and Jumping on the FEI’s official video platform FEI TV, if you are based outside of the UK. In the UK, live coverage of the Cross Country and Jumping can be seen on the BBC Red Button and BBC Sport website. For full TV listings and broadcast times, please visit the Badminton website here. Our signature Twitter hashtags for this series are #Classics and #Eventing. We encourage you to use them, and if you have space: #FEIClassics #Eventing. The Mitsubishi Badminton Horse Trials Twitter handle is @bhorsetrials and hashtag is #MMBHT.